Indo-Pak dialogue about Pak Terrorism. Zardari Mischievous? Moments after shaking hands, Prime Minister Manmohan Singh told Pakistani President Asif Ali Zardari on Tuesday that his mandate was simple: to tell Pakistan that it must end all terrorism against India. NEW DELHI: India’s Prime Minister Manmohan Singh reiterated Wednesday that he wanted to try again to make peace with Pakistan, but stressed Islamabad needed to take ‘strong and effective’ action to end terrorism, PTI reported. The comments came a day after Singh met with Pakistan’s President Asif Ali Zardari on the sidelines of a regional summit in the Russian city of Yekaterinburg, their first face-to-face talks since the deadly Mumbai attacks. In this meeting, the two sides agreed that their foreign secretaries would meet on ‘mutually convenient dates’ to be followed by another meeting of the two leaders on the sidelines of the Non-Aligned Movement summit in Egypt in July. ‘The two foreign secretaries will meet at mutually convenient dates and discuss the steps to be taken on either side to deal with extremism and terrorism and from those discussions the political leadership will re-engage at Sharm-el-Sheikh (Egypt),’ Foreign Minister Shah Mehmood Qureshi said after the meeting. ‘It is essential that strong and effective steps are taken by Pakistan against the enemies of peace,’ Singh was quoted as telling journalists accompanying him on his way back from Russia. Singh said if the Pakistani leadership shows ‘courage, determination and statesmanship to take the high road to peace, India will meet it more than half the way.’ He added that he has ‘spoken before also about my vision of a cooperative sub-continent and the vital interest people of the sub-continent have in peace. For this, we must try again to make peace with Pakistan,’ the Press Trust of India quoted him as saying. Earlier in Russia, Mr Mehmood Qureshi and Indian Foreign Secretary Shiv Shankar Menon and National Security Adviser N.K Naraynan joined the two leaders for a photo session. He termed the meeting between the two leaders a ‘positive development’ and said ‘the only sensible course was to talk to each other’. He said the people of South Asia wanted peace, security and development and wanted the two nations to live in harmony. The Foreign Office in a statement issued after the talks said ‘the two leaders among other things discussed the question of resumption of the composite dialogue. Pakistan believes that the resumption of composite dialogue, and addressing seriously and with sincerity, a range of issues, is the only way forward.’ Asked if Pakistan would raise the water dispute with India, the foreign minister said that all contentious issues could be raised when the talk process began. The president expressed the hope that Pakistan’s relations with India would enter a new era and the existing outstanding issues and disputes, including Jammu and Kashmir, would be resolved. The statement said that Pakistan remained committed to friendly and good neighbourly relations with India. ‘My mandate is to tell you that Pakistani territory should not be used for terrorism against India,’ the Press Trust of India quoted Prime Minister Singh as telling President Zardari. It said that after Mr Singh’s comments Mr Zardari immediately asked journalists to be escorted from the room so the meeting could be continued in private. PTI reported that Mr Singh was also understood to have conveyed India’s ‘unhappiness’ over Pakistani inaction against terrorism aimed at India. Mr Singh also expressed disappointment over the release of Jamaatud Dawa chief Hafiz Mohammad Saeed suspected by India of being among the masterminds of the Mumbai attacks. The two countries have already completed four rounds of the composite dialogue, but the fifth round was halted by India after the Mumbai attacks in November last year. On Board Prime Minister’s Special Aircraft:Prime Minister Manmohan Singh said on Wednesday that India wanted to try again to make peace with Pakistan but Islamabad should take “strong and effective” actions to end terrorism against his country like it has done with regard to Taliban. A day after he met Pakistan President Asif Ali Zardari in Yekaterinburg, Singh said if the Pakistani leadership shows “courage, determination and statesmanship to take the high road to peace, India will meet it more than half the way”. Singh said Zardari had told him that he was sincere in fighting terrorism but he talked about difficulties his government is facing in tackling the menace and sought “some time” in this regard. “I have spoken before also about my vision of a cooperative sub-continent and the vital interest people of the sub-continent have in peace. For this, we must try again to make peace with Pakistan. But for this regard. “I have spoken before also about my vision of a cooperative sub-continent and the vital interest people of the sub-continent have in peace. For this, we must try again to make peace with Pakistan. But for this, it is essential that strong and effective steps are taken by Pakistan against the enemies of peace,” Singh told journalists accompanying him on his way back after attending two multilateral summits. Towards a Civil war in Pakistan :: Military About to take Control Over Capital :: Opposition Leaders Confined. Former Pakistani prime minister and opposition leader Nawaz Sharif has been placed under house arrest in the city of Lahore, his party officials said on Sunday, hours before he was due to address a protest rally. “Detention orders have been issued for Mr Nawaz Sharif, Shahbaz Sharif and other senior party leaders,” Sharif party official Naseer Ahmed Bhutta said outside Sahrif’s house, which was surrounded by police. Sharif’s brother, Shahbaz, is also a politician and a senior member of his party. Source Courtesy : Yahoo Services. Islamabad, March 14 (Agencies): The Pakistan Government today said it would appeal a court ruling that barred Nawaz Sharif and his brother from elected office, in the first major concession to Opposition leaders that came amid stepped-up US efforts to end the standoff. The decision to file a review petition came hours after information minister Sherry Rehman resigned over restrictions on media coverage of protests by lawyers and Opposition parties campaigning for an independent judiciary, and the army was put on standby. Officials said US secretary of state Hillary Clinton telephoned President Asif Ali Zardari and Sharif and voiced concern over the turmoil the country had lurched into. Clinton “urged a settlement through negotiations”, Sharif’s spokesman Pervaiz Rasheed said. Hours later the government announced it would appeal the court ruling in the coming week. “The federal government will file a review petition in the supreme court against the verdict of the supreme court,” a spokesman for Zardari said in a statement. Sharif’s party dismissed the decision as an “eyewash”. “We will go ahead with the long march. No one can stop it. It will be a milestone in Pakistan’s history,” Sharif, who threw his weight behind the lawyers’ protest after Zardari dismissed the provincial administration in Punjab led by his brother, told a rally in Lahore this evening. “As far as the review petition is concerned, we do not recognise these courts, the chief justice of these courts because these courts are unconstitutional,” a spokesman for Sharif’s PML(N) said. “These courts have been established by Pervez Musharraf through an emergency order. Therefore, they do not have constitutional position,” Siddiq Al Farooq told a TV channel. 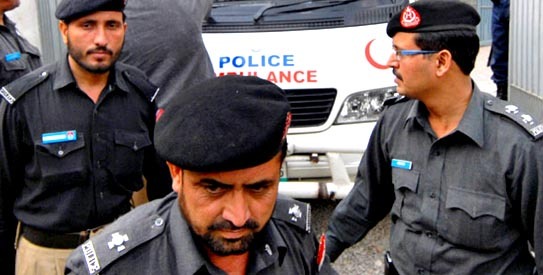 Police temporarily detained dozens of activists across the country, including five people at a gathering of hundreds of lawyers and Sharif supporters in the central city of Multan. “So far our attitude is soft, but we can change our strategy,” Ali Ahmad Kurd, the leader of the country’s lawyers’ movement, said in Quetta after authorities allegedly prevented him from boarding a plane to Lahore. “When one path is blocked, God opens 100 others, and we will reach Lahore and then Islamabad,” said Kurd, whose road convoy was turned back by police a day earlier. Army spokesman Major General Athar Abbas said the government put the army on notice that troops might be needed to protect “sensitive areas” in Islamabad and elsewhere. “When the situation deteriorates, gets out of hand of police, paramilitary (troops), only then the army is deployed,” Abbas said. Earlier in the day, in another sign of strain on the government, information minister Rehman announced her resignation from the cabinet after the private Geo TV channel complained that cable TV companies had blocked its programming in several cities. Geo accused Zardari of ordering the restrictions — an allegation denied by his spokesman. Rehman, who has often spoken in defence of media freedoms, didn’t explain her decision, and the channel appeared to be available again today in major cities. Zardari said Rehman was “ditching” the government at a time of crisis, but she replied that she saw “no point” in continuing in her post, a source said. Rehman also told the President that the media could not be “switched on and off like a light bulb”, the source added. The army said it had received a request from the government to deploy troops at sensitive locations to maintain law and order during the protest by lawyers and opposition parties. spokesman Maj Gen Athar Abbas told Dawn News channel. He refused to identify the sensitive locations. The lawyers’ movement and opposition parties, including former premier Nawaz Sharif’s PML-N, launched a “long march” on March 12 to pressure the ruling Pakistan People’s Party to reinstate judges deposed by former President Pervez Musharraf. The organisers of the protest have said it will end with a sit-in near parliament but the government has said it will not let the demonstrators enter Islamabad. The army’s Rawalpindi-based 111 Brigade, which has usually played a crucial role in past military coups, held a meeting on Thursday to review the law and order situation in the capital and nearby areas. Lawyers and opposition have said the authorities have detained over 1,200 people to thwart the protest. Prohibitory orders banning protests and rallies have been imposed in Sindh, Punjab and North West Frontier Province but the protestors have said they are determined to march to the capital. The authorities have sealed all highways leading to the capital and have forced halt to three big opposition motorcades converging towards Islamabad. Courtesy :: The Times of India // 15-03-2009.